We are one of the few plastic surgery clinics in Sydney to offer Hydrafacial. We are also the only clinic north of Chatswood and one of the only clinics in northern Sydney to offer it. HydraFacial is an innovative technology that delivers the results of an advanced facial in under 30 minutes. It is an experience that is unlike any conventional facial treatment leaving you with confidence and satisfaction. It uses a patented technology which is a hydradermabrasion procedure that can simultaneously cleanse, exfoliate, clear congested pores and deliver nourishing serums to your skin. In addition to instantly noticeable results after each treatment, you will also experience longer lasting results with a short series of Hydra treatments. What are the steps of a Hydrafacial? Cleanse + Peel – Uncover a new layer of skin with gentle exfoliation and relaxing resurfacing. Extract + Hydrate – Remove debris from pores with painless suction. Nourish with intense moisturisers that quench skin. Fuse + Protect – Saturate the skin’s surface with antioxidants and peptides to maximise your glow. A Hydrafacial is for everyone – it offers a vigorous exfoliation that removes dead cells and extracts impurities from the skin while restoring hydration. This leaves the skin more supple and vibrant. During treatment, a gentle chemical peel is used to further exfoliate and improve skin tone and texture. There is also the option to use different serums during treatment to target individual concerns, to achieve the most optimal skin hydration and rejuvenation. By unclogging pores, it achieves brighter, cleaner and clearer skin. 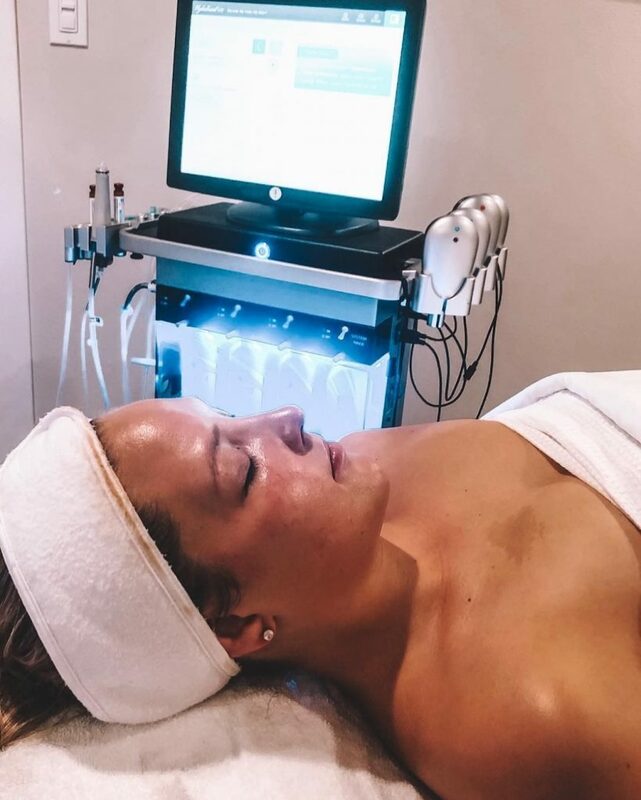 Furthermore, we can combine our Signature or Deluxe treatments with our Medifacials that offer the best of both, leaving your skin glowing and feeling like it has never felt before. I am darker skinned, and concerned that this treatment is not suitable for my skin type? This treatment is designed for all skin types. Even the most sensitive skin easily tolerates the HydraFacial treatment. We will endeavor to choose only the superficial chemical peels during treatment which are safe to use with darker skin types, and choose specific treatment serums and/or customize the treatment for your unique skin conditions and needs. Please come in and consult with our practice nurse for more information. Hydrafacial treatment is not uncomfortable or painful. During the exfoliation steps, as the handpiece is passed over the skin, it feels rough like gentle sandpaper passing over the skin. Some clients prefer a more abrasive facial and therefore the strength can be turned up on the machine, and more pressure applied – this is usually necessary for men especially with facial hair to achieve the appropriate exfoliation and hydration. In women, less abrasion and pressure is required. We always adjust the pressure to the exfoliation needed by our patient and to what you prefer during treatment. What can I expect after hydrafacial treatment? You may experience slight redness for up to 30 minutes following the treatment. Otherwise, you will notice instantly fresher, dewy, clear and glowing skin. How can Hydrafacial be used for Acne Treatment? It can be extremely effective for treating acne scars as well as oily skin, which is a major cause of acne breakouts. Which is better – Microdermabrasion or Hydrafacial? Hydrafacial is better than microdermabrasion as it is more lenient on the skin during the exfoliation process. The shedding of dead skin cells is gentler and much more pleasant than microdermabrasion. Microdermabrasion can feel abrasive and result in reddened irritated skin post-treatment. Some patients have even noticed more acne and the appearance of blotchy skin after microdermabrasion. Hydrafacial is the best solution for plump and firm skin with less downtime and long-term results you can see and feel instantly. The standard Signature Hydrafacial treatment takes approximately 30-40 minutes. 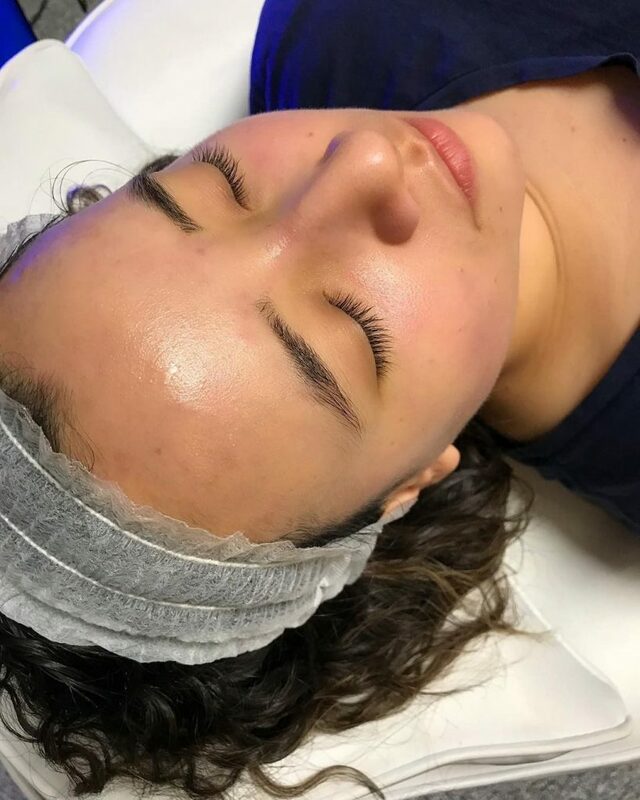 Our Deluxe Hydrafacial and more specialized treatments can extend for a longer period with lymphatic massage, customized skin boosters, and LED light therapy. This takes 60 minutes. The signature Hydrafacial costs $250. A package of three can be purchased for $600 (reducing the cost to $200 each). The deluxe Hydrafacial costs $350. A package of three can be purchased for $850 (reducing the cost to $283 each). Our introductory offer is on now for Signature Hydrafacial for $150 and Deluxe Hydrafacial for $210.Please confirm this with the client. Subscribe to our email newsletter, which is delivered monthly, to keep up to date on any specials that we have running. For a full list of complementary treatments see our price list in the non-surgical procedures section of our website. Ideally, you should get a treatment once every two weeks. Once your skin is in a good place, you could then go on a maintenance program of once a month. How long do the effects of a Hydrafacial last? The smooth results and hydration may last up to 5-7 days or even longer. We don’t believe in quick fixes, so one treatment per month is recommended for improving the appearance of fine lines, wrinkles, brown spots, oily and congested skin. Is there a before and after gallery? There is no downtime. You may put on makeup and return to your normal activities right after the treatment. Are there any precautions before the treatment? You should not have had anti-wrinkle or filler injections in the 1-2 weeks prior to the treatment. You also need to not be pregnant or breastfeeding. Other contraindications (reasons why you cannot have a Hydrafacial include): herpetic rashes, skin cancers on the face especially if they are ulcerated, inflammation of the skin of the face, or severe forms of acne. You also cannot have it if you are allergic to shellfish. See the full list of preparing for a Hydrafacial in this blog further below. Can I have Hydrafacial while I am pregnant or breastfeeding? Unfortunately, it seems that most active ingredients are not safe for use during pregnancy or breastfeeding and therefore you cannot have it whilst you are pregnant or breastfeeding. You can also not have the treatment if you are allergic to shellfish. Do I have to change my skincare routine when I am pregnant? · Retinol is commonly used in anti-ageing and skin treatments. · Unfortunately due to its strength, it is not suitable for pregnant women. · It can be listed as a Retinoid, Retinol or Retin-A on some products. · Hydroquinone is most common in skin lightening treatments and occasionally some stronger acne treatments. · Hydroquinone is absorbed deep into the skin making it unsuitable for pregnant or breastfeeding women. · Salicylic Acid is commonly used in acne treatment and also in many skin care products and skin care treatments. Unfortunately, it is not suitable for use in pregnancy. · The oral form of Salicylic Acid is said to cause birth defects. Though the topical form that is generally used in skin treatments is unlikely to cause problems it is still best to be safe and stay away particularly from products with a higher strength than those sold over the counter. · Benzoyl Peroxide is also used against acne. · It is controversial whether or not it is safe for use in pregnancy. · Tetracycline is an antibiotic commonly used to kill bacteria to fight Acne. · Not advised during pregnancy. Some clients can experience redness or pinkish colour to their skin from the suction and exfoliation during treatment – in most cases, this subsides within 15 to 30 minutes. Can I have Hydrafacial after botox? You should not have an anti-wrinkle injection first and then this treatment soon after. 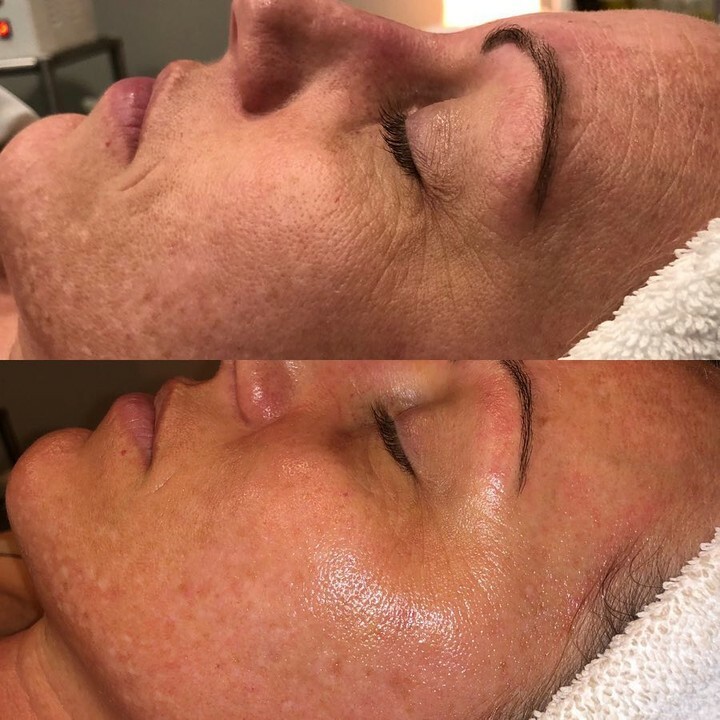 This is because Hydrafacial increases blood flow to the area where the injections were performed – this means that before the anti-wrinkle product is fully absorbed and active, it will cause unwanted “drift” or spread. However, you could have the facial first and then the injections soon after (even on the same day). What other treatments can be combined with a Hydrafacial? Come see our practice nurse at Mode Plastic Surgery for a skin care consultation, during which we will take a thorough history and examination and work out what is best for your skin. A Hydrafacial treatment can be conducted on the same day as your skin consultation, provided there are no contraindications such as pregnancy, breastfeeding or other medications that you may be taking. (b) Addition of LED light therapy (Healite) which is part of our Deluxe Hydrafacial and can be added to our Standard HydraFacial treatment. For best results, you will need a series of LED light treatments which can be purchased as packages at a discount from our clinic. (c) The combination with a Medifacial treatment – a medical combines facial massage, with the Skincare company range of chemical peels, and skin products to produce the ultimate in relaxation, skin exfoliation and hydration that will leave your skin feeling amazing. (d) A trial of our medical grade skin care – at the conclusion of your treatment when the pores of the skin are cleaned and open we can employ the use of specialty serums and facial moisturizers that will enhance the effects of your treatment. You can receive some sample/tester pots of these products or even purchase them to take home at the time of treatment, to enhance the results from the treatment. We can also make Hydrafacial one component of your facial rejuvenation journey. During your skin consultation with our practice nurse, enquire about our fillers, anti-wrinkle injections, and other surgical treatments that can produce the results that you may be after. 1. Discontinue use of Isotretinoin for 6 months (e.g. Accutane). 3. Refrain from any type of exfoliating treatment(s) (glycolic, enzymes) to the area of treatment for 48 hrs. 4. Refrain from any Medium/ Deep chemical resurfacing and laser treatments for 1 month. 5. Refrain from waxing and use of depilatories for 48 hrs. 6. Discontinue use of over the counter acne medications (Benzoyl Peroxide, Salicylic) for 48 hrs. 7. If you are prone to cold sores, Hydrafacial may cause a break out; you may need a prescription for prophylactic treatment such as Valacyclovir. Please use medication 2 days before, during and 2 days after. 8. Avoid sun tanning or tanning creams/sprays for at least 72 hrs. 9. We recommend waiting at least 2 weeks for filler or anti-wrinkle injections, or if you have had these recently wait at least 2 weeks to have treatment. 10. For Gentlemen’s Hydrafacial treatment shaving is not recommended on the day of treatment. If you choose to shave, please shave at least 3-4 hours prior to your treatment. 11. The day of your appointment a full consultation will be provided. If you have any special health considerations, allergies, pregnant, etc., be sure to notify us when you make your appointment. 12. However, feel free to contact us with your concerns if in doubt about whether you are a candidate for this. 1. It is recommended to not sweat for 24 hours after the treatment (no exercise, sauna, swimming pools or hot tubs). 2. Avoid sunbathing for at least 48 hrs (although, we recommend this indefinitely) to prevent UV rays from damaging your skin which slows down the benefits of Hydrafacial. Patients who absolutely cannot avoid sun exposure should use a broad-spectrum sunscreen with an SPF of 30 or higher to maintain your improved skin. We recommend the Skincare Company sunscreen which is SPF50+ and can be purchased for $26 from our rooms. 4. Waxing and depilatories can be resumed in 48 hrs. 5. If you do not need make-up for the evening of treatment, wait until the next morning. 6. Topical prescription medications can be resumed in 48 hrs. 7. Over the counter acne medications may be resumed in 48 hrs. The above is a guideline and not exclusive. For more information come see our practice nurse at Mode Plastic Surgery. Contact us on 1300 80 9000, or email us at info@modeplasticsurgery.com.au for bookings or further information.